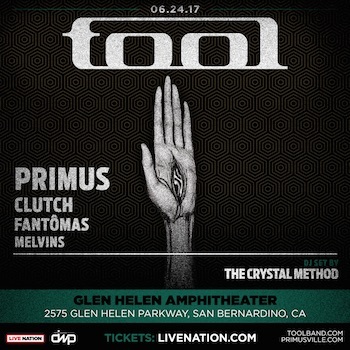 Clutch and Fantômas—in a very rare live performance—will join iconic band Tool along with Primus, Melvins, and DJ sets by The Crystal Method at Glen Helen Amphitheater in Southern California on Saturday, June 24, 2017. Clutch—known for pushing the boundaries that define heavy rock music—is one of the world's most respected and influential hard rock bands. Clutch is touring in support of their 11th studio album Psychic Warfare, while laying the groundwork for their next studio album. The brainchild of Mike Patton, Fantômas is an anti-hero from a series of pre-WWI French crime novels, sometimes dubbed the "lord of terror." Rounding out the lineup are Buzz Osborne on guitar (Melvins), Trevor Dunn on bass (Mr. Bungle, Trevor Dunn's Trio-Convulsant) and Dale Crover on drums (Melvins). This will mark the band's first U.S. show since 2008. This is a unique opportunity to experience Tool's unparalleled sonic and visual performance, along with live sets by some of the most highly acclaimed artists beneath the picturesque San Bernardino Mountains in Devore, CA, just outside Los Angeles. Tickets for the show—which is produced by Danny Wimmer Presents and Live Nation Los Angeles—are on sale now at www.Ticketmaster.com. Glen Helen Amphitheater is a short drive from Los Angeles County, Orange County, San Francisco, Las Vegas, Phoenix, Tucson, San Diego, the San Joaquin Valley, and many more cities in the Southwestern U.S.